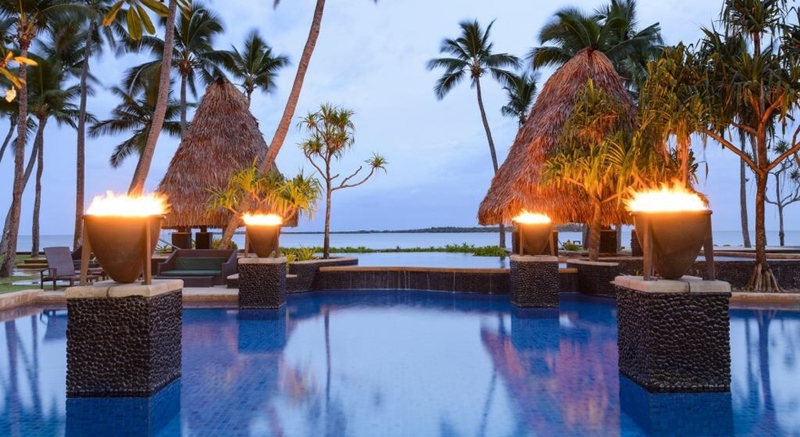 The Westin Denarau Island Resort and Spa unfolds over 30 acres of pristine beachfront property. Whether it’s the private beach, the award-winning Heavenly Spa by Westin™, the 18-hole championship golf course, or the seemingly unending selection of dining choices, this resort promises to accommodate dreams and anticipate desires. From garden view hotel rooms to oceanfront suites, The Westin Denarau has it all. For example; Beautifully appointed, the Ocean Front Suites overlook the resorts lush tropical gardens, palm fringed beach and the enchanting ocean and feature all the standard room amenities, DVD player and surround sound system as well as a fully appointed kitchenette featuring two hotplates, microwave, fridge and dishwasher. Refreshingly spacious, the suites are inspired by traditional Fijian design featuring earthy colours, contemporary furnishings and intriguing Fijian artwork. Relaxation comes easy with your own private balcony or patio offering spectacular views of this South Pacific paradise. Fiji is known the world over as one of the most beautiful, natural paradises in the Pacific, where the sensuous climate and exquisitely mild water temperatures ensure full-year enjoyment for lovers of the sea. A wide range of water sports, from kayaking to standup paddlle boarding, hobbie cat, windsurfing and luxury boat charters are available. Cruise on own private charter boat through the beautiful Mamanuca Islands to swim, snorkel, or surf with tropical fish, and experience Fiji’s prestige environment. Our team of professional and experienced watermen will ensure that your safety and comfort is priority, so you can lie back and enjoy the view and soak in everlasting holiday memories. Heavenly Spa by Westin: Peacefully nestled amidst 1,350 square metres of lush meditation garden, the Heavenly Spa by Westin is perfect setting for spiritual healing and sensory pleasure. This award-winning Spa is beautifully designed to blend with nature. As one of the most sophisticated spas in Fiji, this carefully constructed facility features a beautiful authentic design, a lush and peaceful environment, luxurious spa amenities and renewing body treatments.